Why drag someone around a mall when you can leave them happily playing games while you buy stuff? Visiting a mall can be a tiring and frustrating experience, especially if you really don't like shopping. So one mall in China came up with a solution specifically targeted at all those husbands who accompany their wives but really don't enjoy shopping. According to the BBC, they are called "husband storage" and take the form of a glass cubicle or pod. Inside you'll find a comfortable chair and access to a range of video games from the '90s. Initially use of the pods is free, but there's plans to introduce a charge payable by smartphone to access and use them. According to Chinese website The Paper, the pods are popular, but also lacking in a few key areas. The biggest complaint so far is a lack of air conditioning, which means you are sitting in a glass cubicle sweating while playing. I think there's also a missed opportunity here to sell users of the pods cold drinks and snacks. It wouldn't be difficult to integrate a vending machine into the back or side of the pods, but it could result in greasy gaming pads. If the pods get really popular I can see banks of them being installed just like in internet cafes. Then they can be networked together to allow for multiplayer gaming. Before you know it we'll have stories about people living out of them while playing online games all day. Social media in China is apparently split on whether the pods are a good idea or not. 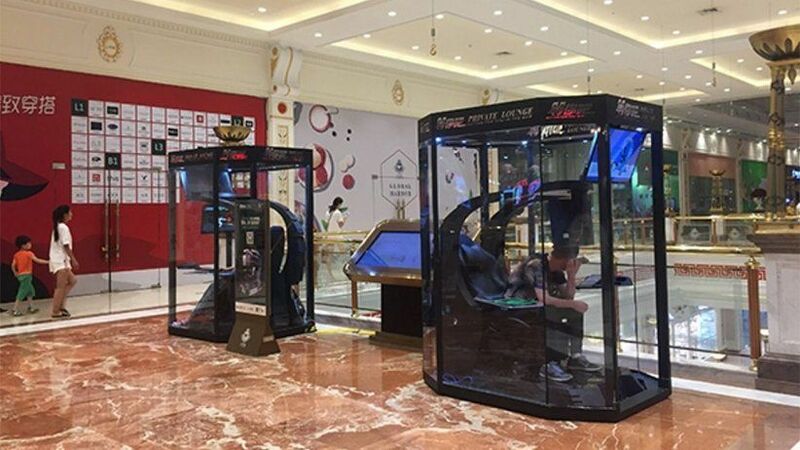 On the one hand it could encourage partners to go to the mall with their spouse, but on the other, what's the point if all they are going to do is disappear inside a glass box?